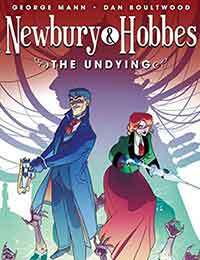 Newbury & Hobbes: The Undying Average 0.00/5 - out of 0 total votes. Need to dismantle rogue automata, uncover plots against the crown, or put down a zombie infestation? Newbury and Hobbes are the Victorian duo to call on! Writer George Mann (Dark Souls, Doctor Who, Warhammer 40,000) brings his steampunk mystery novels to comics for their 10th anniversary, alongside Dan Boultwood (It Came!, The Phoenix).